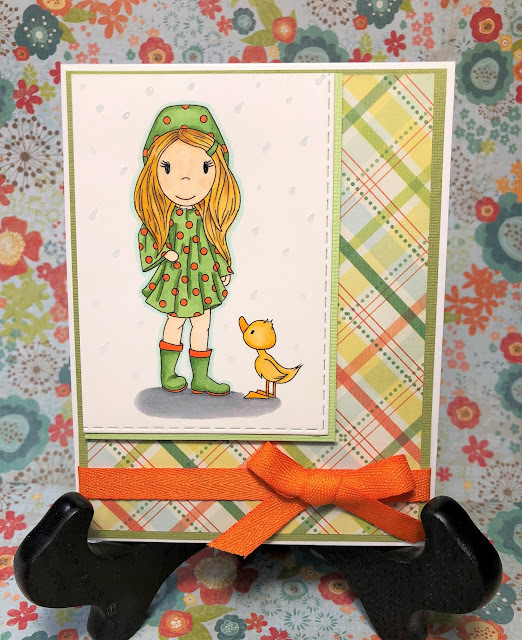 Love from Lizi is hosting a lovely color challenge on her blog to go with this month's Card Kit! And the colors are so bright and bold--just like this kit! I chose to use this super vibrant paper with the Tucans on it, and pair it with the incredible Tucan die that came in the kit! The Tucan paper was too busy by itself so I cut a rectangle stitched die to cut a more subtle paper, matted on the dark green paper from the kit. I cut the die-cut 3 times, from black, red and yellow so I could inlay the different colors. I added clear Wink of Stella over the body of the bird to make it look more like feathers. Then I added clear Nuvo drops over the beak. 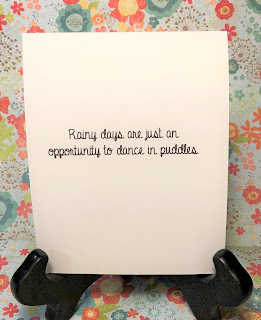 For finishing touches, I added three rows of bright yellow ribbon behind the panel, and three yellow Nuvo Drops, as well as a simple sentiment on the grey paper from the kit. The inside sentiment I printed on my computer--a saying from Winnie the Pooh: "Always remember you are braver than you believe, stronger than you seem and smarter than you think." 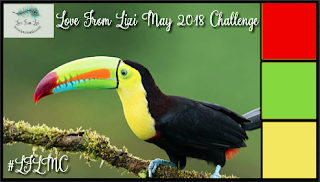 Please be sure to head on over to the Love From Lizi blog to see the new kit, and all the great Challenge Cards that the other Design Team members have put up! 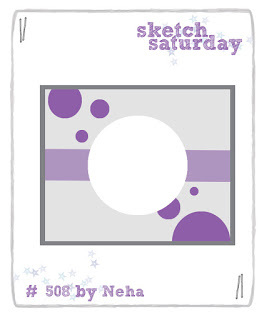 Sketch Saturday has a fun new sketch up today--#510! The sponsor this week is Star Stampz! 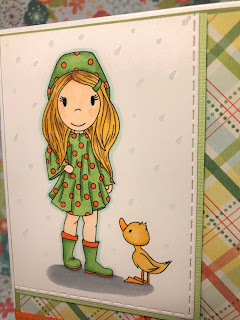 I absolutely loved this adorable stamp--even though its not the best for a card. And I REALLY couldn't make it small enough for an A2 card. I ended up making a 5 1/2 x 6 inch card, and even making it bigger I still had to use Prismacolor Pencils as my medium since I can sharpen those down real fine. I used a ribbon in-place of the small strip on the left of the sketch, 3 Nuvo drops instead of the stitching, and decided to not include a sentiment. I used a whole slew of colored pencils, there's no way I could list them all! On the larger areas--anywhere that had enough space that I could do, I used Gamsol to blend the colors. I also added some yellow Wink of Stella on the Elf's hair; Gel-roll on the eyes of the elf and the bunny, and a micron pen for her glasses and for the 2 birds. I also used a red micron pen for the berries on the bush, and a white uni-ball on the elf's wings. I left the inside of the card blank so I can add a specific sentiment later if I'd like, or just leave it blank. 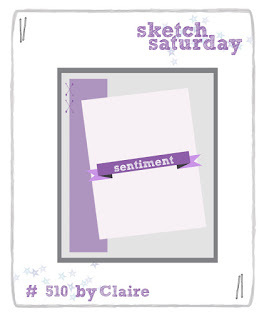 Be sure to head over to Sketch Saturday Challenge Blog to see all the other lovely cards! It's time for a Sketch Saturday Challenge again!! 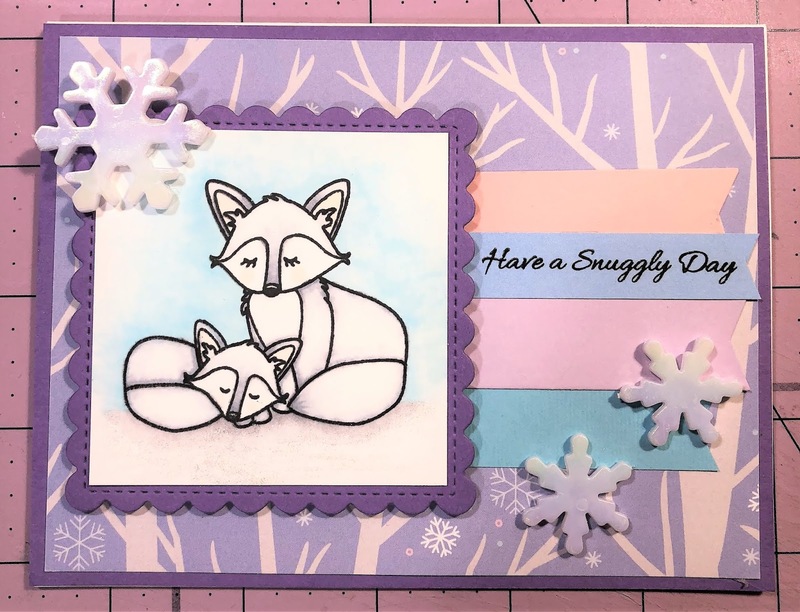 Sketch #508 was super simple for me, and I love the way it turned out, using this adorable image from Kitty Bee Designs. As you can see, my final design matches almost exactly with the sketch! I only moved the flowers a teensy bit for better aesthetics on my card. The base mat is a charcoal grey generic card stock from Hobby Lobby--and is the same one I used for the scallopped circle. The black stripe in the middle is from a scrap of black card stock, probably also from Hobby Lobby! The Yellow hexagon piece is a Recollections, and actually was a only 3 3/4 inches rather than the 4 that I needed, so I cut it down the middle and was able to cover that with the black strip--Viola!! The flowers are all just from my stash--probably from Hobby Lobby or Michaels. The base was, as usual, printed on my HP with the simple sentiment You are BEE-Utiful, to help send some bright, happy cheer with this bright happy bee! I'm so happy that you choose to visit today! Please head over to the Sketch Saturday design blog to see the inspiration from the other lovely DT members, and enter to win a digi from our lovely Sponsor Kitty Bee Designs! The sketch today on Sketch Saturday is actually one of my own designs! The blog is sponsored by Paper Nest Dolls, and I love their adorable images, so the hardest part about this week's challenge was picking my paper and colors! After choosing my image, I then went looking for the paper I wanted to use, so I could match the coloring to the paper. I chose another piece from the DCWV Fresh Floral Paper Stack. Since this was my own sketch design, I didn't feel the need to alter it too much! I just chose to change the sentiment strip into a ribbon and have no sentiment on the cover of this card. I colored Avery and her duckling friend using Copic Markers. I cut the image panel with a stitched rectangle die, and matted it on a light colored green card stock--I did cut the top and left side of the panel off to make it look right fit into the corner like it was. The card base was printed on my printer and reads "Rainy days are just an opportunity to dance in puddles". For finishing touches I of course added the orange ribbon and bow. The image panel was raised on fun-foam, and I added "rain-drops" with Sea Breeze Nuvo Jewel Drops. Thank you so much for stopping by and playing along with us at Sketch Saturday!! I have super exciting news: I was asked to participate on the Love From Lizi Social Media Design Team!! This means I will be receiving the lovely card kits that Lizi creates each month!! I will not be required to make the 10 Cards/1 Kit video, but to make the cards and create related blogs. I will probably still make the videos! But please keep an eye here for upcoming blog posts including the Love From Lizi Card Kits!! 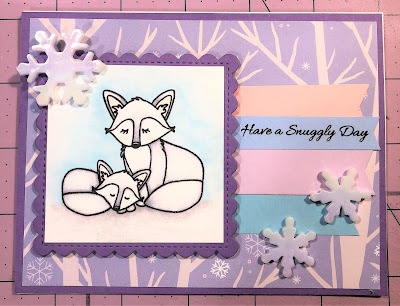 For my first post for Love From Lizi, I have made almost 20 cards with the February Card kit!! I'm going to start with the first 10 cards, which I made a Reveal Video for, which you can watch on my YouTube channel. The paper I used for the base of this card was my absolute favorite! Paired with the green Love Wreath and Everyday sticker, then matting done with the yellow and pink card stock from the kit. I added hot-pink embroidery floss from my stash and finished with sequins from the kit. My second card used the black and pink Argile-style paper, and used up some more of my favorite paper as a banner to match the chalk-board banner piece. Paired that with the yellow-heart paper, all matted on hot pink to make them stand out. Hot-pink embroidery floss again, hand stitched across the top and finished with a few more sequins from the kit, matted on pink, and placed on a top-folding card base! The next one I make, I like so much, that I made a second one very similar to the first! I loved the way the cupcake paper matched with the cupcake on the chalk-board piece. I used some yellow Stickles to accentuate the candles on the cake piece. Another lovely Birthday card using this heart chalk board piece. The heart was gilded with the Nuvo flakes in the kit. I used the Gold Peel-offs around the edges. Look, a Non-Birthday Card!! I felt that the Be Dazzling cut apart went great with the diamond paperclip and the gold-mirror pieces. I love how all the elements of this design came together! Another CAS style card! I like the simple design with just the 3 colors. I loved the combination of these colors and the chunky glitter. Paired it with the Celebrate cut-apart, and some of the pink ribbon from the kit. Love your Fabulous Self! Paired the cut apart with the Harlequin design paper and black & white striped paper. Finished it with the gold peel-aparts and gold banner piece from the glitter card-stock. This is probably my favorite card from the whole set. I loved this ombre striped paper. The cloud piece was created with Broken China Distress Oxide ink. Love this spinner design with the balloon! I liked the way this paper matched the Celebrate the Everyday Moments cut-apart. I accentuared the side-bars with some of the gold peel-aparts. I finished it all off with the narrow lime-ribbon, a small banner cut with the die in the kit, and some pink Nuvo drops, also from the kit. The last 2 cards did not turn out as well as I would've liked, so I didn't inlcude them in my "10"...they're extras. The majority of these balloons were cut with a Stampin Up punch. I colored the white Happy Birthday sticker to match...however, I don't like the way it looked. Oh well! The balloons with the numbers were stamped with Stampin Up ink, then embossed in white with Lizi's stamps. So these were the first 10 +2 cards that I made and revealed in my YouTube video! I have also made 10 more cards for a total of 22 cards with this kit (possibly 1-2 more in the works, we'll have to see!) So please check back and be sure to check the Love From Lizi Facebook page and Blog page to see the rest of my February cards! Cutest Happy Easter Card EVER!! 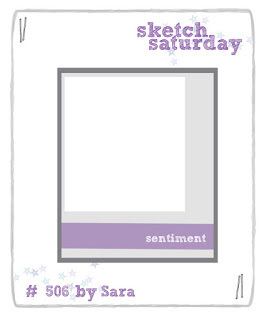 This week's sponsor at Sketch Saturday is Sasayaki Glitter Digital Stamps and boy! Do they have some adorable images! 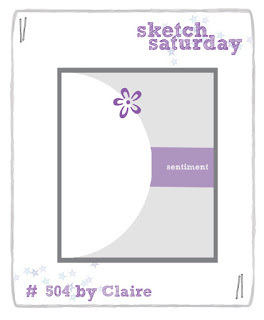 We are on Sketch #504 this week, which I managed to tweak only a little--adding a bow over the horizontal piece rather than an embellishment to the top of the circle and changing the circle to an Egg shape! Well, and not including a sentiment on the front of the card--but who's counting! I colored this super cute Easter bunny and chicks with Copic Markers. The sky was created using a stencil cut from cardstock with a cloud die, then brushing Broken China Distress Oxide Ink with ClarityStamp Blending Brushes--the BG10 matched the Broken China perfectly. I don't yet have a Distress Ink for grass, so I used Sweet Leaf from Close to My Heart. I used my ScanN Cut to cut the egg shapes, since I don't have dies. (I also used the SNC to cut the mask for the image so I could blend the background.) I used fun-foam to lift the egg-shaped panel and give space for the pretty pink ribbon to lay behind it. The Pattern paper is from the Fresh Floral Stack from DCWV. As usual, I chose to print my card base as this gives me unlimited options on sentiments! I kept this fairly simple and non-descript so it can be sent to a variety of recipients. I'm sure the other DT members have some great card-inspiration to share as well, so be sure to head over to Sketch Saturday, and join the fun!